This feature is from illustrator (i used cs4). It shows the user all the color used, and let him modify any of them. saves the user time of selecting objects and sub object individually. also the ability to make a keyboard short cut to it is vey important. I'm very miss this thing. Thanks for your feedback. Just a note to advise you to change your forum username to something else to prevent spammers from getting your e-mail. 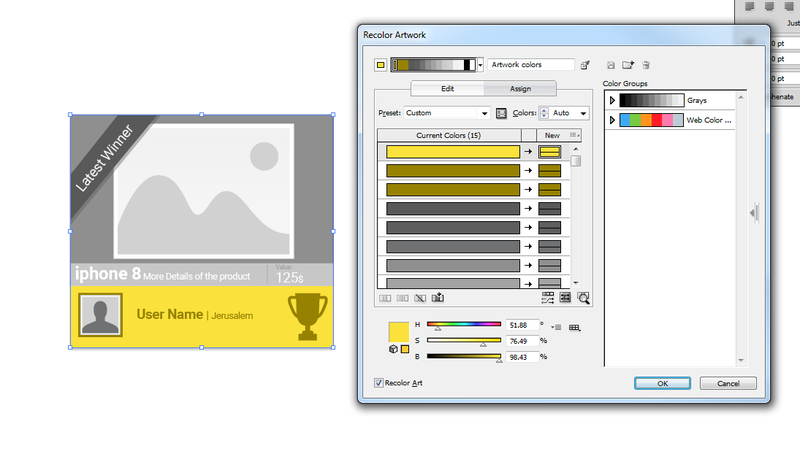 The Recolour Artwork function of Illustrator is brilliant. I'd also like to add my vote for this. I do however understand it's a quite complex tool, and as such we're not going to get it anytime soon. Recolor Artwork is useful precisely to deal with files created by others, when they did not use global colours. It's also useful to reduce the number of colours used in a design, again created by others. Looking for a way to select all objects with the same fill color such that I can adjust them all simultaneously. Currently there's no way to select objects by its attributes but if all you want is to change their fill colour you can define/set a palette of global colours and apply them to the objects. Every time you update one of the global colours all objects using it will update accordingly. If that's not your goal and you just want to really select them by their attributes then i'm afraid there's no way to achieve this yet. What kind of adjustment do you need? If you want to change the color to all of them, it would be nice idea if you defined that color as global. Nice idea and what I received from someone else are two different things, wouldn’t you agree? Perhaps a way to convert every instance of a color into a global color would be a more semantic way to achieve what everyone is asking for in this thread. I find global colors more convenient to work with. Can't understand why A-Team keeps static colors, still. I don't disagree with you, but I cannot control the quality of upstream documents. Additionally, when prototyping designs I don't yet have an understanding of what is a global color until the design has matured. At which point, being able to convert all instances of `#FF33FF` to a global color with `#FF33FF` would be invaluable tool and cover many use cases. I don't understand you. You can use global colors all the way in your design(s). You can change their definition any time and see your design with different color. If you don't change some color it will be a kind of static. Let's say someone sends you a vector graphics file that contains a draft brand guideline and it doesn't have global colors setup. Being able to turn all instances of a color into a global color would be a massive timesaver. Let's say you're doing an illustration and it isn't until you've completed the illustration that you understand which colors are global colors. Being able to turn all instances of a color into a global color would be a massive timesaver. Let's say someone sends you a file that uses the same color over and over again, but since they don't use Affinity Designer they send it as an SVG. Being able to turn all instances of a color into a global color would be a massive timesaver. My example was for starting a design from scratch, not if you get it from a customer. At very start you create all colors as global. It sounds like your arguing about creative process, not features of tools. As a general rule I don't argue with people about their creative process because I find it to be rude.